The Scepter tank heater is a versatile series of steam heaters designed for direct injection of steam into tanks for heating water compatible products in a vibration free, quiet and 100% efficient fashion. Furthermore, the Sceptre tank heater develops a strong stirring action to help keep any solids or particulates in suspension. This stirring action also helps to produce uniform temperature throughout the tank volume allowing accurate thermostatic control. The tank heater is constructed of type 316 stainless steel the standard Steam Heater Scepter™ Tank Heaters are available in one inch through ten-inch pipe sizes and may be mounted in a tank from above, below or with a side port configuration. 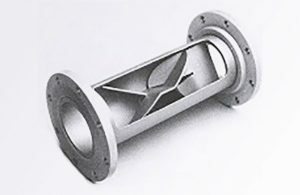 They are available with threaded pipe connections for the steam from one inch through three-inch pipe sizes. 150 lb. 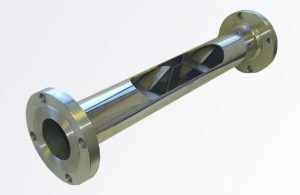 RFSO flanged connections available on all sizes. 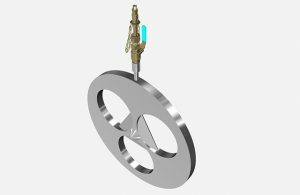 Each sceptre tank heater employs a special Komax® module via a pipe having a diameter about 2/3 of the Equalizer® outside diameter. 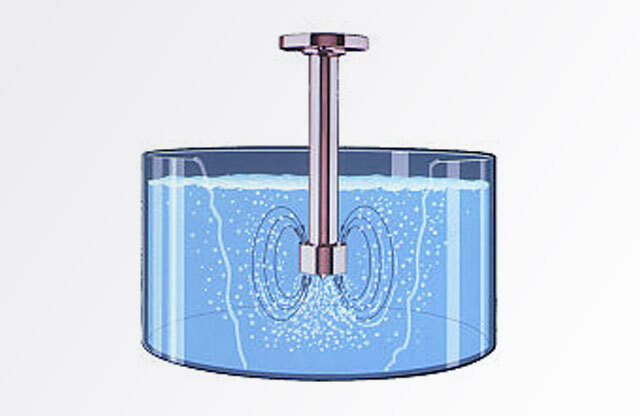 When inserted into a tank of liquid the momentum of the exiting steam draws the liquid into the perimeter of the module surrounding the steam inlet. 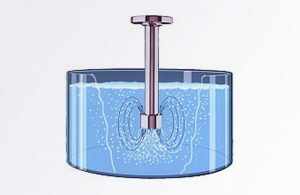 Water and steam are divided and mixed by the mixing elements in each of the module holes and exit as a set of co-rotating vortexes. These form multiple impingement mixing zones at the exit of the mixing module to produce complete contacting of steam and the product to be heated in a low noise and low vibration fashion. No auxiliary air supply is required for quiet operation. Northwood pulp and Timber Company in Prince George British Columbia, was plagued with a problem of violent vibrations and banging when heating a large volume paper machine chest with a conventional steam sparger. The tank walls were lined with ceramic tiles which were cracking, sections were coming off the wall due to the vibration from the collapsing steam bubbles. Bill Neville, the Plant Engineer, contacted the Komax Systems representative, Austin & DenholmInc., in Vancouver. ADI recommend installing a Komax “Scepter” direct steam tank heater. After the Scepter installation the vibration and banging totally disappeared. Chest or tank volume: 37,140 U.S. gallons. Starting temperature: 43 deg. F.
Final temperature: 122 deg. F.
Steam source: 65 psi, saturated. Heat Input Required: 24..5 MM Btu. Total Heating Time: 2 hours. Temperature Rise Rate: 40 deg F/hr. Steam Flow Rate: 10,000 #/hr. Control Valve Position 100% open. After the Komax Scepter installation, the mill found it also produced a faster heating time and provided very good tank circulation. A major industrial account in the state of Maine needed to heat a large rectangular tank of water in less than 30 minutes to provide quick start-up to their production. After seeing the simplicity of the Komax “Scepter” direct steam tank heater with no moving parts they ordered one. The 6 inch diameter Scepter Heater was installed in August 1999. The unit operates with no vibration, noise or water hammer. The direct steam injection Scepter increases the temperature of the water from 80 degrees to 140 degrees F. Based on standard steam spargers the plant engineers had calculated the heating time would be at least thirty minutes. The engineer in charge of this new installation was amazed that the Komax Scepter Heater was able to achieve the temperature increase in just six minutes! This time savings has led to a quicker overall startup for their system and has been a significant money saver for the customer.